Here at Wholistic Woman, I’m all about keeping it real. Real as in honest, not “real” as in a food fundamentalist. I was meeting with Laura (my health coach) a few weeks ago and she reminded me of the time I started crying in her office because I was so ashamed of buying rhubarb from the store instead of the farmers market. I don’t even think it was organic, OR local! That was back when I first started seeing her. I wanted to lose weight and thought maybe she had the magic diet or herbal supplement recommendation that could help me. Instead we’ve been on a three year long journey together that has completely transformed my relationship with food. It’s my journey, I want to be clear. What works for me won’t necessarily work for someone else. There are ladies in the bariatric community who would scream in horror at the photo above, which is a real photo that I took at Meijer of my actual purchase. First there’s the wine. There is a lot of controversy about drinking alcohol after weight loss surgery. DH and I followed our surgeon’s orders and did not drink until about six months after surgery. And we are very aware of the danger of transfer addiction (replacing food addiction with alcohol addiction). But the fact that I can drink one glass instead of a bottle after dinner tells me that I’m not in danger territory. Is it empty calories? Yes, but with marathon training I’m concerned about not getting enough, not really about too many. Then there’s the pie. Horrors, sugar! Now, RNY patients have a reason to avoid sugar. About 30% of them get dumping syndrome. It’s less common in VSG patients, which is the surgery that DH and I had. We don’t get dumping so we can eat sugar. I’ve gone back and forth with Laura about how much sugar I should be eating. I mean, lots of websites make it sound like a tablespoon of sugar will kill you. There are countless articles about sugar detoxing. But by making it off limits, I find myself craving it more. So we have decided on a number of grams that is right for me. Funny thing though, once I gave myself permission to have 25 grams a day I never actually bothered to count it, because I don’t seem to want it. The mind is such a funny thing! 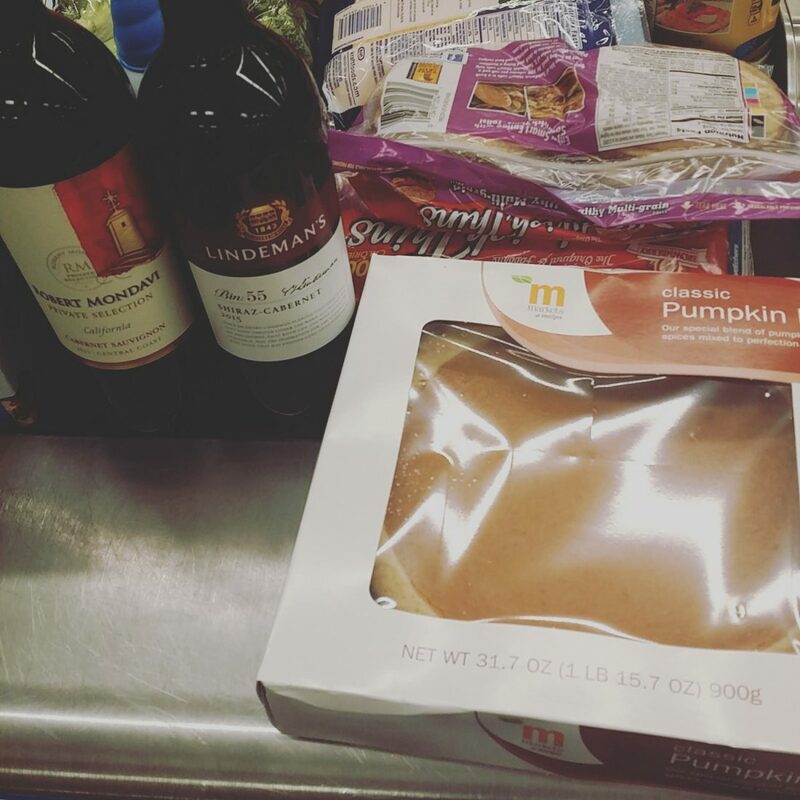 But I did buy a pie because it was on sale and Thanksgiving was in a couple of days and DH and I LOVE pumpkin pie. In the old days, DH and I would have polished that off in two days, max. This one lasted 3-4. I could barely finish one piece at a time. Finally, there are the Sandwich Thins. They are a staple in our home. We can’t eat much bread (normal bread is SUPER filling), and once upon a time I toyed with the idea of going gluten-free. But they are so convenient for a quick meal (egg sandwich) or pre-run snack (with peanut butter and jelly or raisins). They also have CARBS! So many people swear off pasta, bread, potatoes . . . but honestly, DH and I have lost weight just fine even with daily Sandwich Thins in our diet. Now, we are also running lots of miles a week. So I’m not telling you to go on a Sandwich Thin diet. I’m just saying, we need to take the whole picture into account. Avoid the holiday weight gain! I was originally going to participate in the #HolidaySweat challenge, even though I don’t really “do” challenges. I thought it would be fun and maybe I could earn some prizes. I was even willing to overlook the obnoxious term “freggies” (I hate the word veggies, although I use it occasionally, and it seemed even more annoying by combining fruit with it to come up with “freggies.”) But then I realized that the other part of the challenge was counting minutes of exercise, and after a couple of weeks I had to admit that I wasn’t actually going to track minutes of exercise. I mean, I technically could look at my Garmin data from the runs and figure out how many minutes I did, but what is the point in entering it into a spreadsheet? My goals are about mileage and speed, so my reward for improving is actually running for FEWER minutes! How much exercise does it take to burn off that Thanksgiving meal? WHO CARES!?!? I’ll bet if you stick to a CONSISTENT diet and training program, then you can have some pie and enjoy your holiday without any unwanted weight gain. So, while I am planning to employ other strategies to stay healthy over the holidays, I won’t be counting minutes of exercise or freggies. #Grateful. Eleven World Renew staff ran an impressive full marathon, a challenging half marathon, or a respectable 5K to raise funds for World Renew’s Free A Family® program! My first marathon is only a week away, yikes! I am definitely nervous because my piriformis has been getting worse, not better, even though I’ve been resting it as much as I can and stretching. However, I am determined to finish. It might not be fast (in fact it probably won’t be), but I will at least cross the finish line in a day ending with Y. I can’t believe how far I’ve come in the past year. Wish me luck! I was going to participate in the #HolidaySweat but it’s all just too much work for me to keep up and take pictures of everything that I do. I hope you have a great marathon! Good luck on your marathon!! Where I adore the #holidaysweat challenge, I also found myself reverting to ED issues. I somehow missed the whole freegies thing and just wanted to log workouts, but since I don’t measure my fruit or vegetables I decided not to do that part. I like to log my workouts, it helps me stay on track. I need the reminder and logging minutes helps me meet goals I set for myself. Though, I understand why others don’t. I am always on the organic non gmo train, but I buy them when I can and don’t allow myself to freak out over food anymore. It took years to get to that point though. I buy things that are not organic, I do refuse to buy non gmo produce (Barcode reading helps that), but now I feel crappy when I eat or drink anything processed. I mean I still buy a pie! But I make almost everything from scratch where I can control the ingredients. Plus it has helped me learn to cook! I love how we can all have different ways to finding our mental and physical health. We can implement someone else’s style or not. It makes it fun to try new things and keep from getting obsessed with food, weight loss, and having them own our lives. It sounds like you have a very good awareness of what works for you and what doesn’t. We are all so different with different goals and personalities. Which makes sense, we are all one of a kind. One size does not fit all! What a great thing to realize.